One topic that catches my attention are articles about the wrist action in the golf swing. The articles that I have read cover the coaching philosophies of both passive wrists versus active wrists action. The Majority of articles that I have read lean more toward having an active wrist, rather than maintaining a passive wrist and letting set naturally. I’m in the camp, like Sir Nick Faldo, of having an active and presetting wrist, if done properly. The key word is– if done properly. There are very few fly fishing enthusiasts that would consider fly fishing without understanding the proper use of their wrist. I remember watching the movie, The River Runs Through It, with Brad Pitt, Craig Sheffer, and one of my favorite actors who played in TOP GUN, Tom Skerritt. The movie centered around fly fishing in Montana. 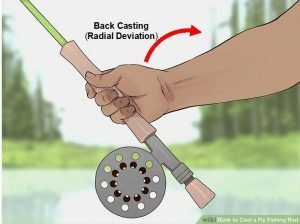 There was a line in the movie by Craig Sheffer describing Brad Pitt’s back casting, “It’s all in the wrist.” Back casting is a back-and-forth motion of the fly rod and line that allows fishermen to place the fly into a particular spot. It would be impossible to perform the back cast maneuver without having the proper active wrist action. The wrist action gives the back casting that whipping action and sound that almost appears to be like art in motion. I could not imagine performing back casting without two distinct wrist action called Radial and Ulna Deviation, in golf this is cocking and un-cocking of the wrists. These are two of six maneuvers that the wrist can perform very effectively, as noted in the two diagrams of the wrist below. These six wrist actions have advantages if done correctly. But done incorrectly are very frustrating and are a disadvantage for the golfer. First, right off the bat, let’s identify the wrists before getting into the wrist action in the golf swing. The wrist isn’t where one would wear a wristwatch or GPS rangefinder. This area is actually the lower forearm. The wrists are just below the wristband on a pair of kickboxing gloves and shown below in a model of the lower forearm, wrist, and hand. This model of the wrist shows a very important feature called the Radial Styloid Process (RSP), this is the nodule just above the thumb that protrudes outward. The RSP is an important checkpoint for properly presetting the wrist, particularly the lead wrist. One of the three trigger muscles connects to the Radial Styloid Process. The checkpoint is where the RSP is pointing toward the golfer’s trail shoulder. Right shoulder for a right-hander and left shoulder for a left-hander. 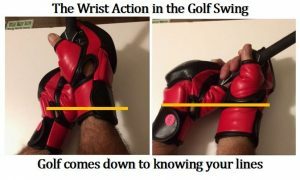 I use these kickboxing gloves shown in the figure above in my coaching process to help people understand their wrist and how it is used properly in the golf swing. 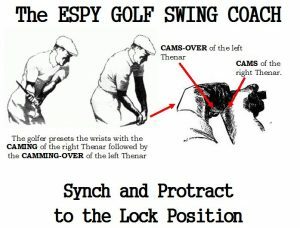 I particularly focus on two elements in the ESPY Golf Swing, Sync/Preset maneuvers. The Sync component is combination of two wrist maneuvers called Palmar-Dorsiflex. The second is called Pronation. Both are illustrated below in the Palmer Preset Golf Swing Technique. These three (3) maneuvers, Palmar-Dorsiflex and Pronation, the golfer must learn to develop the proper wrist action in the golf swing. The golfer performs these three simple maneuvers we perform each and every day sets 80 percent of the golfer swing. Sir Nick Faldo demonstrated this in a YouTube video that he made. The wrist action in the golf swing is crucial for making a proper golf swing and locking the wrists and golf club onto the proper ONE plane swing plane. The only issue with the wrist– is the wrists are essentially a universal joint, having six maneuvers. In the ESPY Golf Swing all six are performed, but they need to be in the correct sequence. The golfer trying to achieve the correct golf swing must set their wrists in the correct sequence and synchronize their wrists with their forearms, elbows, and shoulders during the takeaway procedure in the golf swing. This goes back to the article entitled “The Picture Perfect Golf Swing.” This article covers the topic Mentalization, or Mental Imagery in Sports, where the golfer is trying to use imagination to enhance the golfer’s performance. If the golfer is struggling to perform the golf swing properly, the golfer first trouble shooting needs to be with Syncing/Presetting of their wrist action in the golf swing since this represent 80 percent of the entire golf swing. One prop the golfer can use to achieve the proper wrists action in the golf swing is the pair of EVERLAST kickboxing gloves that I mentioned earlier, particularly the hinging below the left wristbands for the right-handed golfer. The more precise the golfer’s imagination is, the more precise the golf swing will be. 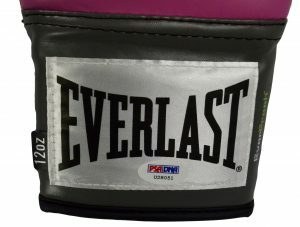 I have a pair of EVERLAST kickboxing gloves that I use as a part of my CASPER Workout Program. Working with the punching bag develops me stamina, both mentally and physically, but more importantly strengthens three key trigger muscles in my wrists and forearms. I use these trigger muscles to help my muscle memory. These muscles for a right-handed golfer are: Palmaris Longus Muscle/Tendon, Hypothenar, and Brachio-Radialis Muscles. Not your ordinary household words, are they? I realize like boxing the golfer uses the majority of their 640 muscles to execute their golf swing. But there are key trigger muscles that the golfer can use to create the domino effect like a chain reactions just by Syncing/Presetting these muscles. Even Ken Duke, a professional golfer, gave one of the best interviews to Lisa Cornwell, a host with Golf Channel, on presetting, or what Ken refers to as hinging, the wrists. Referring back to the kickboxing gloves featured again, I’m gripping my training club with my kickboxing gloves like I would be in the address position to illustrate something unique that occurs after the golfer Sync/Presets their wrists. Focus on the gold line that I have drawn on both before and after photographs of my Sync/Preset maneuvers. BEFORE- The gold line goes from the top of the wristband on my left kickboxing glove to the bottom of the wristband on my right glove. Now AFTER I Sync/Preset, both top of the left and right wristbands are aligned or what I refer to as synced in the Lock Position. This is what great about using kickboxing gloves as a visual coaching technique. Remember the subconscious mind learns based on visualization. You perform the Sync/Preset maneuvers correctly and 80 percent of your golf swing is performed correctly just by using three muscles and three simple maneuvers. The golfer can actually feel these three muscles engage and set. This is what is fascinating by the ESPY Golf Swing, is the feel. The last thing the golfer wants to do on the golf course is think; in stead they want to feel and have an instinctive golf swing. All due respects to Bryson DeChambeau and his interview with David Feherty that was aired on 25Mar2019, but the golfer doesn’t want to think. The golf swing has to be instinctive because which part of the brain we are using on the golf course, the subconscious mind. I have a degree in Engineering heavy with physics. But, the golfer can’t think, they have to do. There’s one thing that I can guarantee the golfer, You may very well practice your golf swing and take golf lessons using your conscious mind of thinking concerning the WHAT, but I can guarantee the golfer that once they step foot onto the golf course that they will be relying totally on their subconscious mind, instincts. The subconscious mind runs the show when it comes to HOW on the golf course. Matter of fact, if the golf swing isn’t instinctive the subconscious mind will sabotage all those swing thoughts the golfer works so hard to develop on the range. When there’s a conflict between the conscious mind, how the golfer typically practices, and the subconscious mind, how the golfer will perform on the golf course, the golfer’s subconscious mind will win the face-off or duel. If your golf swing isn’t instinctive you won’t have it on the golf course. 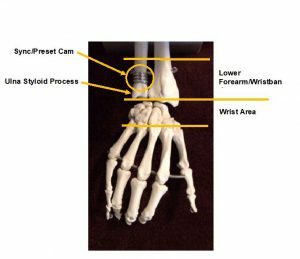 To help the golfer understand the Sync/Preset element, I break it down in a Online Download Training called: QATR-101- Anatomy 101- The Wrists Action in the Golf Swing. This training will help the golfer to develop an instinctive golf swing, or muscle memory, and motor-skills in the subconscious mind. Developing the instinctive golf swing is also a great way to deal with pressures, adrenaline, and anxiety of a round or tournament. The instinctive golf swing also allows the golfer to relax and stay focused and allow the conscious mind get out of the way of the subconscious mind and concentrate on the target area. This develops the IN-THE-ZONE performance the golfer has to have. There are 10- Rules that govern how the subconscious mind works. I treat my conscious mind as a spectator to check certain checkpoints like my left pinky knuckle pointing toward my right big toe and a nodule just above my left thumb pointing toward my right shoulder. The reason this nodule called the Radial Styloid Process is important is this is here the Brachio-Radialis muscle connects from the arm along the forearm. One of the functions of the Brachio-Radialis muscle is to pronate the wrists. This is huge in locking the wrists into the Lock Position, shown below. If you perform the Sync/Preset maneuvers correctly, you should be able to take your driver and hit a golf ball off the ground, or what golfers refer to off the deck. The last thing I perform at the end of each training sessions is to do just that, take my driver and hit a golf ball off the deck and see if it has the correct flight and trajectory. If the golfer is looking for consistency in their golf game, the proper wrist action in the golf swing is essential. Consistency is the ‘Holy Grail’ in golf and is a great confidence builder. I don’t know too many golfers who would pass up the opportunity to have consistency in their golf game. This is what training with kickboxing gloves does. If the golfer wants to improve their golf game, they need to switch out their golf glove for a pair of kickboxing glove. If you want to see the magic of kickboxing gloves has on the golfer’s game, look again at the figure below. Pay attention to the gold line in both photographs, blow. The gold line at the top of the left wristband and bottom of the right wristband at address. Now look at after I have SYNC/PRESET my wrists, The top of the left and right wristbands are synced or aligned with each other. The virtual kickboxing gloves give the golfer the confidence and feel to grip and preset the handle of the club. Everything else falls within this mental image of Syncing/Presetting the handle of the club. Also focusing on the kickboxing gloves and the handle of the club narrows the golfer’s focus to a very small area, less distractions. Instead of all of the other hundreds of moving parts and muscles (actually 640 muscles) in the golf swing. 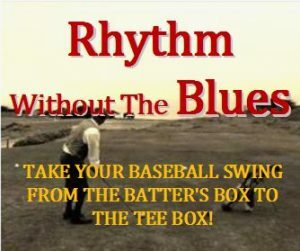 This was the main emphasis of Mr. Eddie Merrins, The Little Pro’s video series entitled, Swing the Handle, not the club. Mr. Merrins, I believe, was trying to reduce the complexity of the golf swing down to the handle of the club. To learn more about the wrist action in the golf swing, I have put together what I call STP Downloads training procedures. 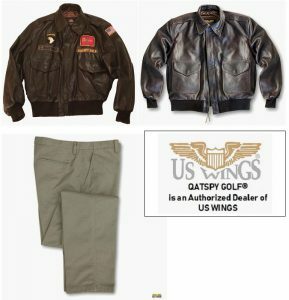 These are listed along the right side of this article. They are very helpful and the important feature for the golfer is they can be downloaded and filed away in a three-ring-binder for a walk-through golf lesson on a on going basis.